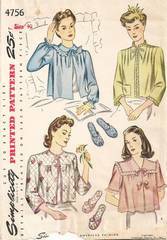 Uncut vintage sewing pattern for women's bed jacket in four styles and open toe slippers. Harder to find, larger size pattern. Bust 40. Includes slippers in sizes Medium and Large. Pattern is complete and in original factory folds. Envelope has some tearing on lower edges, as shown.